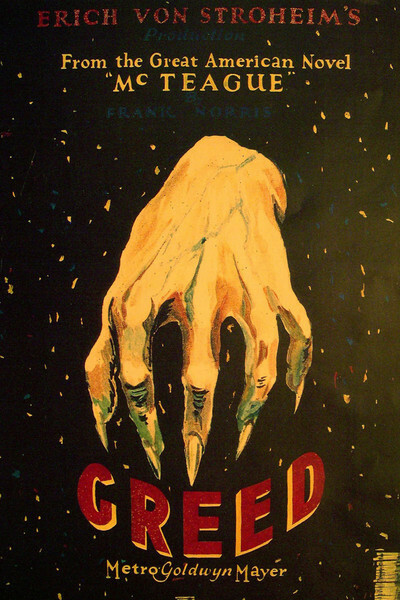 Erich von Stroheim's "Greed" (1925), like the Venus de Milo, is acclaimed as a classic despite missing several parts deemed essential by its creator. Its unhappy history is well known. Von Stroheim's original film was more than nine hours long. After it was cut, cut and cut again, it was released at about 140 minutes, in a version that he disowned--and that inspired a fistfight with Louis B. Mayer. It is this version that is often voted one of the greatest films of all time. The inspiration for "Greed" wasMcTeague,a novel by Frank Norris about the rough, simple son of a drunken miner, who learns dentistry from a quack, moves to San Francisco, marries a woman who is a miser and ends up in Death Valley next to the body of his rival for the woman and her lottery winnings. It was a bleak and sardonic story for the Roaring '20s, and neither Mayer nor his new MGM partner, Irving Thalberg, thought the public wanted it--not at nine-plus hours, certainly. For von Stroheim, a martinet who affected the dress, bearing and monocle of a Prussian officer, their opposition was like a curse that followed him. At Universal, where Thalberg was then employed, von Stroheim's "Foolish Wives" (1922) was cut by a third, and Thalberg fired him from his next film, "Merry-Go-Round." He fled to MGM to make "Greed," which cost $750,000 and took a year to shoot, only to have Thalberg catch up with him there and demand more cuts. No one now alive has seen the original version, but a San Francisco drama critic named Idwal Jones was present at its first studio screening, which began at 10 a.m. and continued without breaks for lunch or anything else, von Stroheim sitting ramrod straight through the whole thing as an example to the others. Jones was a friend of the director's, but his account of that experience does not inspire our envy. He liked the individual parts well enough; it was just that there were so many of them: "Every episode is developed to the full, every comma of the book put in, as it were." He noted that von Stroheim "worships realism like an abstract ideal; worships it more, and suffers more in its achievement, than other men do for wealth or fame." Indeed the film is realistic. Opening scenes were shot in the very gold mine that Norris wrote about; it was reopened for the movie. The San Francisco dentist's office was not a set but a real second-floor office, which still exists. Von Stroheim could have shot his desert scenes outside Palm Springs, but insisted on shooting in the 120-degree heat of Death Valley itself; the camera had to be cooled with iced towels. Some of his crew mutinied and others complained. Von Stroheim slept with his pistol, and as his two actors engaged in their death struggle he screamed: "Fight! Fight! Try to hate each other as you hate me!" These memories and others are recalled in a book about von Stroheim by Thomas Quinn Curtis, a longtime friend of the director's, who until fairly recent years was the Paris Herald-Tribune's film critic. He recalls lunching one day in Paris with Louis B. Mayer, who told him the story of his fight with von Stroheim. That evening, Curtis had dinner with the director, who said, "That's entirely accurate." Their fight began when von Stroheim took up his gloves to stalk out of the mogul's office. "I suppose you consider me rabble," Mayer said. "Not even that," said von Stroheim. Mayer struck him so hard that von Stroheim fell out through the office door and onto the floor, still clutching gloves and cane. "You see, my hands were occupied," he told Mayer's secretary. The missing seven hours of "Greed" have been called the Holy Grail of the cinema. Apparently they were destroyed to extract the silver nitrate used in their manufacture. The movie that remained had a decent run in the 1920s, and was later restored by silent film historian Kevin Brownlow; it is that version that is considered a masterpiece. Now an ambitious new approach has been made to the material by the film restorer Rick Schmidlin, who discovered a trove of original production stills and a copy of von Stroheim's long-lost 330-page original shooting script. He has taken that material and edited it together with the surviving footage to produce a four-hour version that premiered on the TCM channel and will be available on video. Comparing the two versions, we can see how not only length but also prudish sensibilities went into MGM's chop job. Early in their relationship, McTeague and Trina take the interurban train out into the countryside. As they're standing at the station, Trina's title card in the shortened MGM version reads, "This is the first day it hasn't rained in weeks. I thought it would be nice to go for a walk." In Schmidlin's reconstruction from the shooting script, it reads: "Let's go over and sit on the sewer," and so they do, perching on a manhole cover. The original version of "Greed" is perhaps a masterpiece more lamented than missed; there is a point after which an audience will simply not sit still. Even von Stroheim's friend Jones wondered if it could be shown "on the installment plan," and muses about how "German professors sit for years before they developsitzfleish,"loosely translated as iron rumps. My own feeling, having seen both versions, is that movie lovers will want to begin with the familiar 140-minute film (which after all is a great experience) and then, if their curiosity is aroused, look at Schmidlin's version to get an idea of all they have missed. The surviving "Greed" is an uncompromising exercise in naturalism, capturing the rough working-class lives of the new U.S. cities, where saloons doubled as living rooms. And there is a real poignancy in the plight of McTeague, who may by the end be a double murderer but is essentially a gentle, simpleminded soul. One of the scenes cut out by MGM is reconstructed by Schmidlin; it shows McTeague buying theater tickets for his engagement party. He wants the tickets on the right side of the theater. "As you face the stage, or the audience?" asks the ticket seller. "The side away from the drums," says McTeague, confused, and after he becomes convinced the man is toying with him, he explodes. Here is a man who only wants to be a dentist and inhale Trina's lovely fragrance, and his bones end up in Death Valley. His last act is to set free his pet canary, which flutters a little, and dies. No wonder Mayer and Thalberg thought the Jazz Age wasn't ready for this film. Drive In Fright: David Michôd's "The Rover"